Spring Mini Sessions - Now Booking! Your session cost is non-refundable. Cancellations without prior clearance from Sarah Baugh will not be rescheduled, and your session fee will not be refunded. 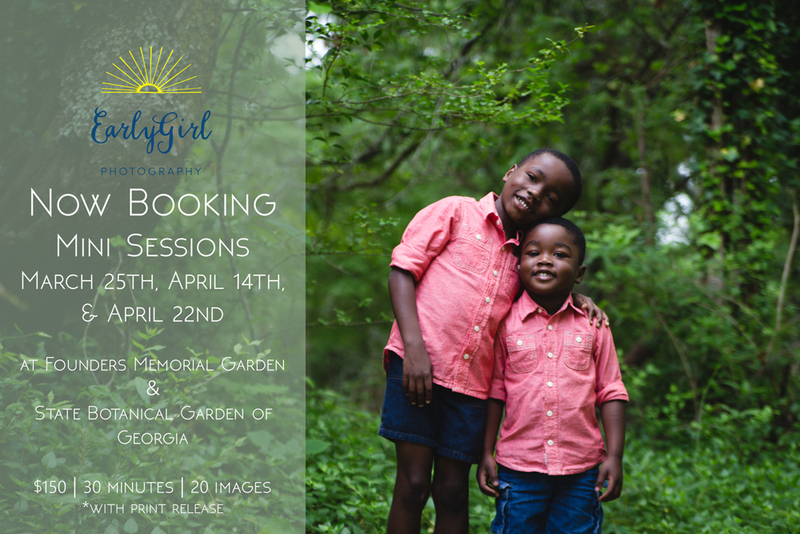 Spring Mini Sessions ~ Now Booking! Here we go! Spring is springing as we speak (hold on a second there, February!) and I am ready to see all of your beautiful faces after the quiet of late winter. Let's get together and photograph your growing babies, I know my own two girls astonish me daily with how fast they are changing - my 12 year old reaches my nose now, oh my. Late winter and early spring are a quieter time in the EarlyGirl Photography neighborhood, and so I can book more birth photography clients! Did you know that I was a doula for many years? I feel like this gives me an extra special something to bring into birth photography, and I would love to bring my quiet, warm, unobtrusive presence in birthing rooms to your birth. I'm offering a discount of $150 off of all births to be photographed during my open windows from January-March, and a free slide show set to music of your birth. Clients who are using the doula services of AthensBorn will get an additional $50 discount, because having a doula is important, and they are amazing doulas. Pop me an email sarah @ earlygirlphotography.com for more information, questions answered. or a list of references.